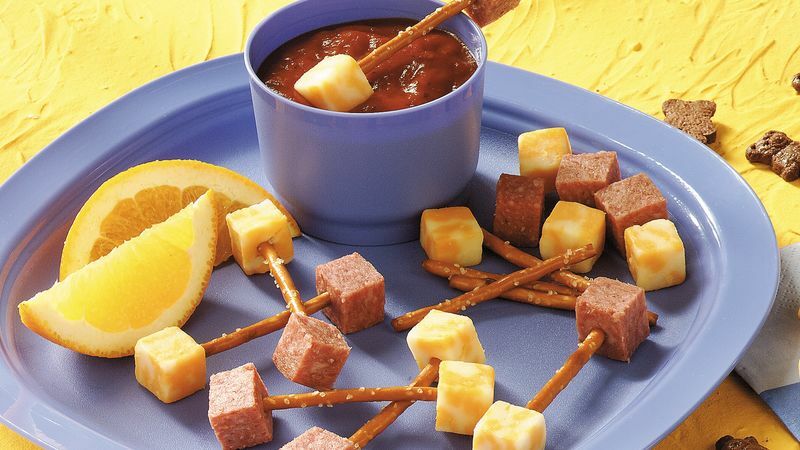 Pack salami cubes and pretzel sticks in separate snack-size resealable plastic bags. Spoon pizza sauce into small sealable plastic container; seal tightly. Pack lunch in insulated lunch bag to keep cold. At lunch time, spear 1 cheese cube on one end of each pretzel stick and 1 salami cube on other end to form dumbbell. Dip in pizza sauce. Orange and graham cracker snacks complete the lunch.